Trabbic’s opens for the 2016 season on Thursday, September 22, 2016, and is open through November 1st. Hours are 10 a.m. through 7 p.m. every day. Click here for a Google map to the farm. Trabbic Farms posted their own web site in 2012. I’ll continue to post as much information as possible. 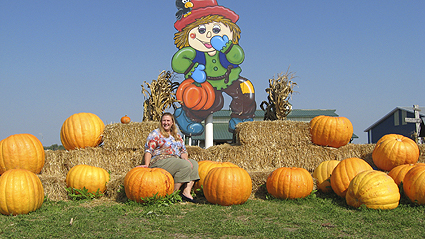 This weekend Mary and I headed to the Trabbic Farm Pumpkin Patch, just east of Dixie Highway on Sterns Rd. in Erie, to see what was up. 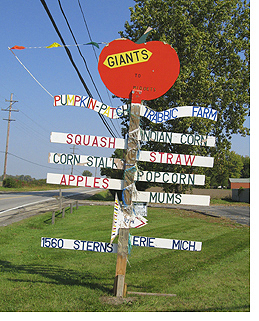 The sign in this picture is located in the northeast part of that intersection, so the pumpkin patch itself becomes that much easier to locate. What we found was a literal sea of pumpkins of all shapes and sizes. I was going to ask Sharon Trabbic if these were all from their own farm, but they weren’t available when we were there. Still, with the number of pumpkins there … I’m thinking those would have been difficult to ship in and still be as fresh as they are. If you go to Trabbic’s (and we recommend you do), there’s quite a bit going on. 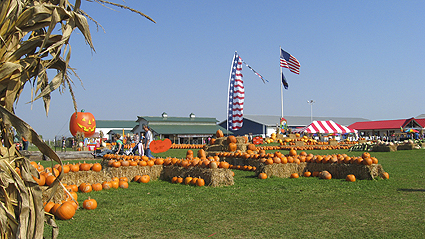 Most of it’s geared towards kids, such as the petting zoo and pony rides, fence and corn mazes, and the 3-car pumpkin train with the rotating pumkin-shaped cars. Pumpkins for sale are sorted by size and price, from tiny decorative ones, through pie pumpkins, and the more popular size seen at the start of this post. The largest pumpkins have been saved in a place for a wonderful photo op with, say, a gorgeous human model. In one of the buildings on the property is a store filled with all kinds of things — coloring books, pumpkin carving tools, decorative items and crafts, and a wonderful assortment of food items. Donuts are made fresh in the morning, handmade pies with Trabbic labels are laid out for sale, there’s an active popcorn machine in the corner … and next to the popcorn machine is a slushie machine loaded with apple cider. On a hot humid day like the ones we had this weekend, an apple cider slushie really hits the spot! In one of the corners, an active bee colony builds and maintains hives in a glass enclosure, a clear tube going through the wall showing who’s leaving and who’s coming in. Next to the bee hive, I found this jar of Creamed Honey from J&D Honeybees in Concord, Michigan. I absolutely love creamed honey! No, creamed honey doesn’t contain any cream. It’s whipped in such a way that it crystalizes and becomes granulated. I’ve had the J&D brand many times over the years. I just spread it on toast for an amazing snack. The other snack shown here is some of Michaelene’s Gourmet Granola, from up in Clarkston, Michigan. Trabbic’s stocks quite a few varieties of Michaelene’s granola. 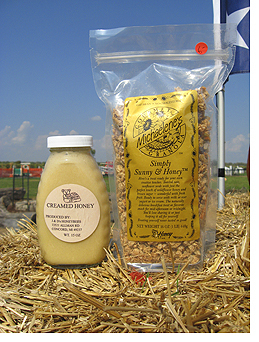 This bag is their Simply Sunny & Honey, with toasted sunflower seeds, wildflower honey and brown sugar. It’s not as dense as a lot of granolas, having a very pleasant lightness and sweetness to it. With all the stuff we picked up at Trabbic’s today, Mary was able to create an outdoor fall display outside the house in no time. 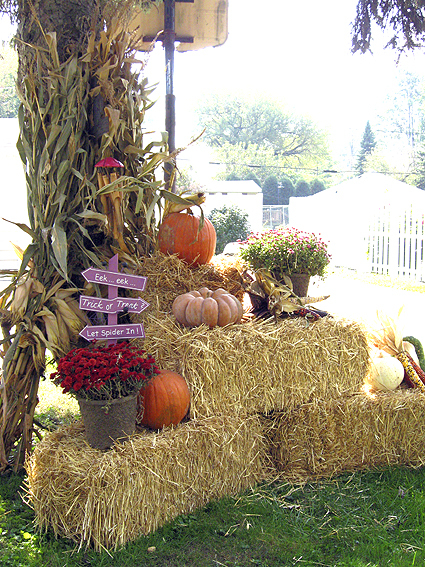 If you’re into fall, decorations, great food and great times, get to the Trabbic Farm Pumpkin Patch while the gettin’s good! Looks like a fun w/e trip! Great photos, too. To Mary(wife of LunaPierCook)nice display! very festive! I think we will have to check out Trabbics! I love taking the kids to Trabbic farm. Mary, your display is lovely. I wish I had the time to even put up my Halloween decorations. Creamed honey? Now THAT would be a project — best left to the professionals, though, and it looks like the folks at J & D know what’s what. I’m glad that my post gave you a craving for apple butter! I’ve never made it before, but it came off beautifully (just two little arm burns! Not bad). I actually made two batches, two different ways (all part of the fun of trying to recreate something that would have been made on a farmstead around the turn of the last century), and will post the results tomorrow, so do check back! Where exactly is this farm located? I think my kids would enjoy it! It’s between Detroit and Suder on Sterns (closer to Detroit Ave.) If you drive up Detroit from Toledo, there is a light at Sterms and there are signs for the farm. Take a right onto Sterms and it comes up on the left. I love taking my nieces and my daughter to the Trabbic Farm. It is the highlight of our fall and they bug me from the moment pumpkins start coming around to go. Also, I love their frozen apple cider slush. Yummy!!!!! Thanks for all the great pictures and the information. My mothers group is going soon and now I am excited about taking my kids there. Kristen, I’m kinda new to the area myself. 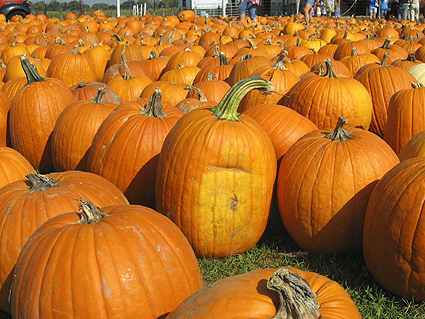 Having grown up in the Flint area we had pumpkin farms that just had … pumpkins. We’d have been more excited if we’d have had something like Trabbic’s. Your farm is womderful my family and i have been comming their ever since my daughter has been born and it is a tradition now . my daughter is now ten. i have tried your pumpkin seeds for the first time last week they are wonderful . i have tried everything to make them the same way i was wondering if you could give me a hint on how you do them? i bought 7 big pumpkins from you and i am down to two. hopefully you can give me a suggestion before i screw up my last two. thank you for a good ten years. Hi! We have gone to Trabbics the last 2 years and had a great time with the kids! We want to go back this year but can’t find any info. on it. Does anyone know when they’re opening, the hours, etc.? @Jen, we’re heading out of town within the hour. I think when we get back, I’ll head down there (it’s a 5-mile drive), grab some info and do a new post on this-year’s upcoming happenings. Stay tuned! I hope you get some info. My little one saw pumpkins today in Ciolino’s and ask when we can go to the pumpkin patch. We always go to Trabbic’s farm. pumpkin patch. Or is it? Your sister is, in fact, correct. We enjoy it there though, and try to look past this part. I think that’s what most people do since Trabbic’s is such a nice place. We were just at Trabbic Farm and I wanted to comment on the religious part for anyone who was concerned. There are about 4 or 5 huge signs (10-15 ft long) around the property that say things like “Jesus I trust you” or something to that effect (I can’t remember the wording exactly). The signs are posted on the barn, on a couple of hay bale displays and a few buildings. That was up last year, but I think this year is the first year they’ve added anti-abortion signs as well. They are a little smaller but unmissable (5-6 feet long?). Things like “Every life has a right – stop abortions” with a picture of a (healthy) baby. Again, something to that effect, I can’t remember the wording. There’s also a big carved pumpkin in a display that has an anti-abortion message as well. There were Christian and Catholic brochures for sale in the gift shop. As for politics, I didn’t see anything but a small McCain- Palin yard sign by the fence as I was leaving. There you have it! Be forewarned if you’re sensitive. I just went to visit Trabbic Farm today. My 4 year old daughter went on a field trip. Almost all parents came. The cost per person was $5.50. For all that we eat popcorn, got a donut and apple cider. Got to pick a pumpkin from the pumpkin patch which we reached by being pulled on a hay wagon. There was so much to do. They even had a big warm fire pit which anyone could add wood to to deep it going. I had so much fun, and would like to got back, maybe even this year. We love it there, mainly because it is a wonderful farm and great for the kids, and love that they aren’t afraid in today’s political climate to show they are Christians. Why should someone hide their views when Christ died on the cross for all of us? Who should be offended by Christ, or anyone who promotes Him? I wouldn’t want to be that person at the bema seat. I think it’s wonderful that they proudly proclaim their Christian beliefs. It takes courage in this day and age of attacks on Christianity. If you don’t like it, simply- GO ELSEWHERE! Last year 2009, my friend from work, Tess, told me about the pumpkin patch farm @ Trabbic’s. I decided to go with my youngest daughter (20) & my two grand-daughter’s, 8 & 12 years. We had so much fun. We walked thru the maze which was total fun & we laughed & laughed. & got pumpkins for all the kids & even my littlest grand-son (1) year now. The kids were SO SO excited, ’cause I surprised them about going. I just said we had to go on an errand. For sure we are going again this year. & This year I’m taking all the grand-kids & hopefully my older daughter & son-n-law if they don’t have to work. I love it there. I love going to trabbic farms . Me and my family practically go there every weekend . I love talking to there very nice family.I expecially love talking to Mary, Mary is very nice and sweet .I really enjoy talking to her. The farm opened on the 24 of September, they close on the 31 of October. They open at 10am and close at 7pm. Could anyone tell me the admission price? @Grace, there’s no general admission but somethings like the pumpkin train and the pony rides have very minimal ticket prices. Are they open only on the weekends? This was the most beautiful farm that I have ever been to. Thank you Trabbic Family for doing such a wonderful job with the St. Stephens’ students today. Deacon Ken really taught the students some new things about pumpkins and faith. We had a great time and can’t wait to go back as a family! 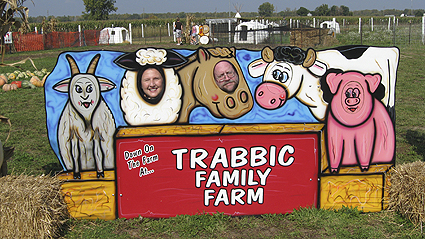 Trabbic Farm is a wonderful place for a family outing! Not only it is very child oriented and friendly, but there is a lot to do and there are no outrageous prices! I would highly recommend this place to anyone looking for a nice, fun fally activity. Looking forward to returning! We have gone the past two years ( my son is three) and it is a little tradition we have started, plan on going every year. Wholesome family fun, and the biggest horse I’ve ever seen! Wendy, admission is free though they may be charging minor costs for some activities. There’s a petting zoo, a corn maze, and a train ride. Pumpkin prices vary by size and there’s a large range of sizes. love to come to this farm but just recently wanted to find out the cost and website didn’t have any prices.. should try to do that as a lot of people have limited budgets but want to come. Mary Ames, admission is free. They sell tickets for rides but nothing else. Pumpkins range from about $4 or $5 for a normal carving pumpkin, decoratives might be a dollar, the monsters were upwards of $30. But they have a huge nimber of items in the store and elsewhere on the property, so posting prices would be logistical nightmare for a small family with a large farm and a store to operate. It took me a few years to convince them to have a web site to begin with (they have religious reasons not to have one), their customers are actually lucky they finally did one. John and Abby you wrote, “… it would be much more appropriate to for-warn those who plan to attend Halloween events, which often promote a very dark and even demonic religious agenda.” While I support the rest of what you wrote, you are probably unaware I was born on Halloween. Here’s a simple fact: The vast majority of Halloween events are not promoting “very dark and even demonic religious agenda[s]”. They are intended to be fun, nothing more. Writing what you did is the same as saying the Harry Potter books and films “promote witchcraft” when, in fact, none of it actually works. Those kinds of statements actually promote an “anti-fun” agenda, and really make no real sense whatsoever. Halloween haunted houses and similar events are not real, and their visitors know it. People have fun there. It’s that simple. Dave, I apologize if I offended you in regard to Halloween. I did not want to diminish the positive spirit of the Trabbic’s in providing a fun option for families looking for a fun way to celebrate the holiday. I agree that the majority of Halloween observances are intended to provide fun and nothing more. My concern is toward the attitude of some that an observance with a religious (particularly Christian) message should somehow be labeled with a warning. If that attitude is allowed toward some observances of holidays, than we must allow that warnings are legitimate toward other observances that have religious or spiritual overtones regardless of how positive or negative they may be. Does that make sense? Thanks for your comment.